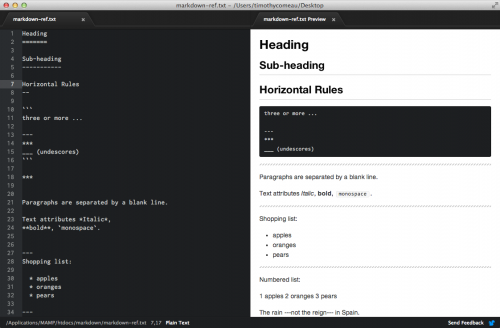 I honestly don’t understand the point of markdown. * this* isn’t any easier than <i>this</i> to me. But the conversation throughout was a reminder to me that Markdown is currently very popular and will probably be around for a while. The popularity of Github has made knowing it an necessity, and doing some recent Spotlight searches on my system revealed an abundance of .md files I’ve already accrued. 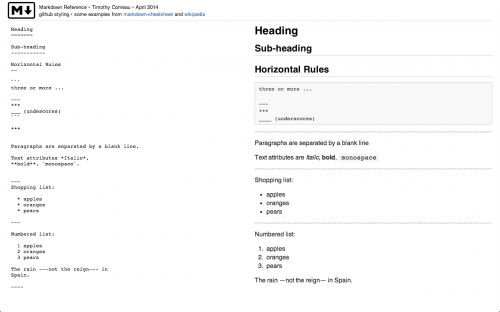 Github’s recently released Atom editor has a Markdown preview function, so I decided to use it and reproduce it as a webpage, to use as a future reference. Because of these sources, and because the one place I will want to write Markdown is Github, I used Github’s conversion styles.